Body Magic is simple and effective, back ache can be a thing of the past. Learn to direct the power of your mind to free yourself from stress and tension. Enhances physical performance, mental focus and well-being. 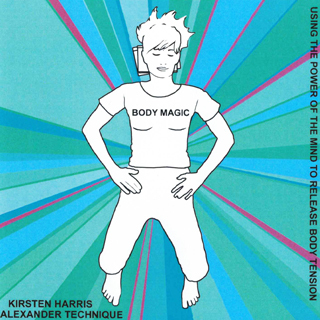 Based on the world famous Alexander Technique, Body Magic takes you on a journey through your body to help you let go of tension and free your muscles. You will then learn to release your muscles into their natural lengthened resting state with the power of your mind leaving you feeling calm, easy, focussed and alert. Body Magic helps to restore your natural poise and confidence. Learn Body Magic to take better care of your neck, your back and enhance your physical and mental well-being. This CD contains two 25 minute Alexander Technique lessons. The front cover shows the semi supine position. Lie on the floor with your head resting on two or three paperback books so that your face is parallel with the ceiling, allowing your neck to be passively stretched. Rest your hands on your ribcage or belly with your knees pointing up to the ceiling and follow with your “minds eye” the instructions contained in this CD. The semi-supine position is a position of maximum rest and mechanical advantage for the body. For maximum benefit, lie in the semi-supine position at least once a day for twenty minutes. Running time: approx 50 mins.